I LOVE this, especially the furnace. Took me a little bit to figure out how to use with no gui but it actually makes perfect sense for those used to the vanilla furnace. The bookshelf doesn't accept most of the books I've collected (many are basically Items) but they're attractive sitting on the cupboard's shelves. Moving inventory into/from the chests is a bit inconvenient, so your chests aren't my main storage. But I love it for a treasure box of favorite or rarely needed items. I love the doors on chest and cupboard. Nice work! Thanks so much for sharing. Hey so I'm really enjoying this mod, especially when played with Better with Mods to allow me access to an earlier (if worse) storage solution. The rest of the aesthetic options are on point. This said, is it possible to change the plank/log/cobble/etc requirements in the crafting recipes to use Ore Dictionary options rather than requiring oak and regular cobble? I'm using it with a variety of other mods and sometimes finding Oak is a pain, including the other options is just more quality of life. Did you remove some features in the most recent version? 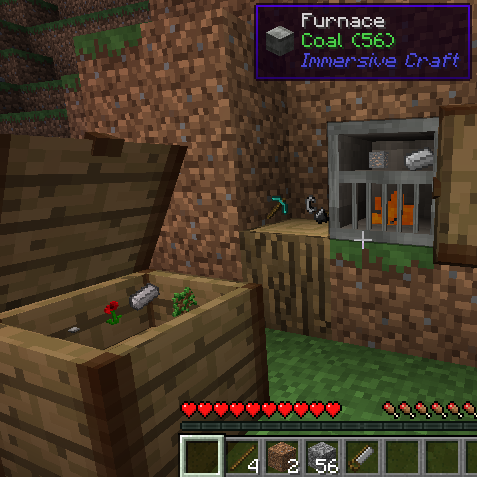 For example, the enchantment table and the anvil aren't in the most recent version. Also, making the axe with the stick and stone doesn't seem to work. 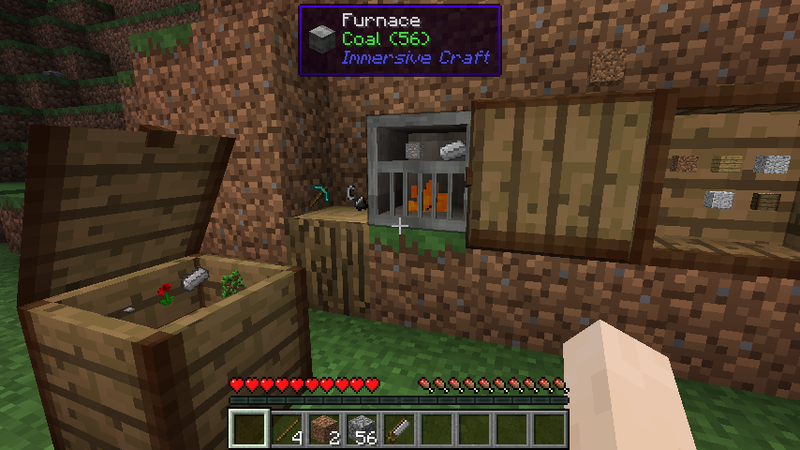 Neither does making the experimental crafting table. EDIT: I understand that you say there is an option we need to change to allow stick+stone on the ground to make a stone axe. What is the directory that I need to go into to apply the option? So this is not related to the mod what so ever so do not be off put by what i ask. I want to know what shaders or resource / texture pack you are using i kind like it. If a higher up can delete this comment please do so. I would remove it myself, but I can not do so. The site will only allow me to edit this comment. Please ignore this comment i tried to delete it multiples times, but the site will not let me delete it. Do I want to carry this module to mcbbs? English is not very good, I hope you can understand. I'm using Lonely Biome and Biomes O'Plenty to create a wasteland world. Is there a way I can get sticks and stones to spawn on the surface and not just in caves? Stupid question, but do these blocks replace the vanilla ones? If not is there a config option for it or can you add one? will you update this mod to 1.7.10 please? Y'know, it's funny you say that, because there are still quite a few mods out there that haven't been updated past 1.7.10. Some people like them too much to give them up, so I would caution against saying that. No one likes it when their feet are trampled upon. He's got a point. You're living in the past and while it's entirely okay to like much older versions, don't expect people to rewrite their mods to accommodate you. Slightly weird request that's important to my modpack all the same: Is there any way that I can generate the on-the-ground sticks on top of water in ocean/deep ocean biomes? Also, if that isn't a thing, I'd really appreciate a config option to do that in the next release.